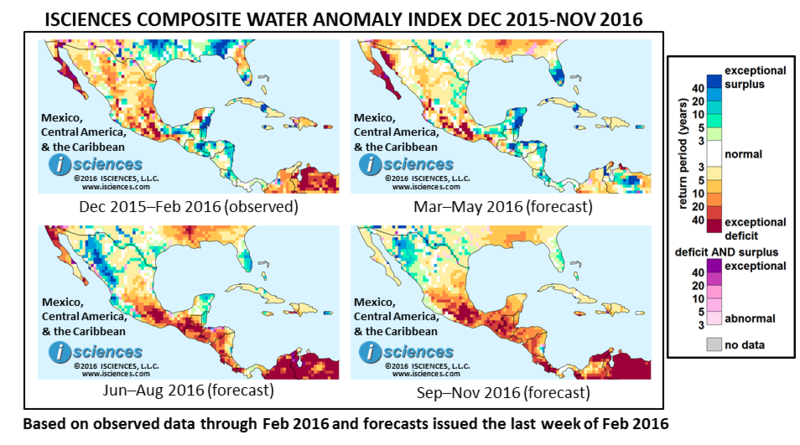 Water deficits are forecast to persist on the Baja Peninsula and will continue to emerge in southern Mexico with exceptional severity as shown in the 12-month map (below). Surpluses are forecast along the Rio Grande River and in a wide path from Sonora southward. Surpluses in central Cuba are forecast to persist through the spring months. Overall for the year moderate deficits are expected in Guatemala and Honduras, though more severe deficits are forecast throughout Central America in the latter months of the forecast period. In drought-stricken southern Mexico, the ruins of an ancient Dominican church have emerged from the reservoir near Jalapa del Marqués, Oaxaca as waters receded to 40% of capacity creating hardship for fisherman and farmers. It's the latest in a series of architectural "rebirths" from the watery depths of Mexican reservoirs over the last few months of drought. Added to drought-driven regional water stress, residents of San Fermin, Veracruz awoke in early March to discover that the Atoyac River, sole source of water for 10,000 people, had disappeared in a sinkhole. In the state of Guerrero, only 15,000 of the 70,000 farmers who lost crops to drought will receive catastrophic agricultural insurance payments due to stringent requirements of state-contracted insurer, Mapfre, prompting the Secretary of Agriculture, Livestock and Rural Development to request bids from other insurers for the current year. The 3-month maps (below) for the same time period shows the evolving conditions in more detail. The March through May map shows the emergence of water surpluses along the Rio Grande and in the Yucatan. Exceptional deficits cover much of the Baja Peninsula and coastal Sonora, and pepper southern Mexico. The emergence of severe to exceptional water surpluses throughout the Sierra Madre Occidental Mountain range in western Mexico is evident in the June through August map, along with the spread of drought in the south and into Central America. Deficits are also forecast for Haiti.